Summon: Give a creature +0/+2 and Guard. 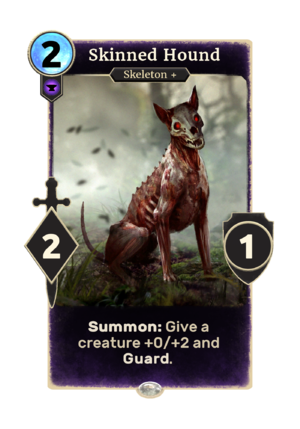 Skinned Hound is a common Endurance creature card. It is part of the Isle of Madness story set. This card's summon ability applies the Osseous Fortitude card effect. This page was last modified on 7 April 2019, at 22:37.